This article is a review of JIN. 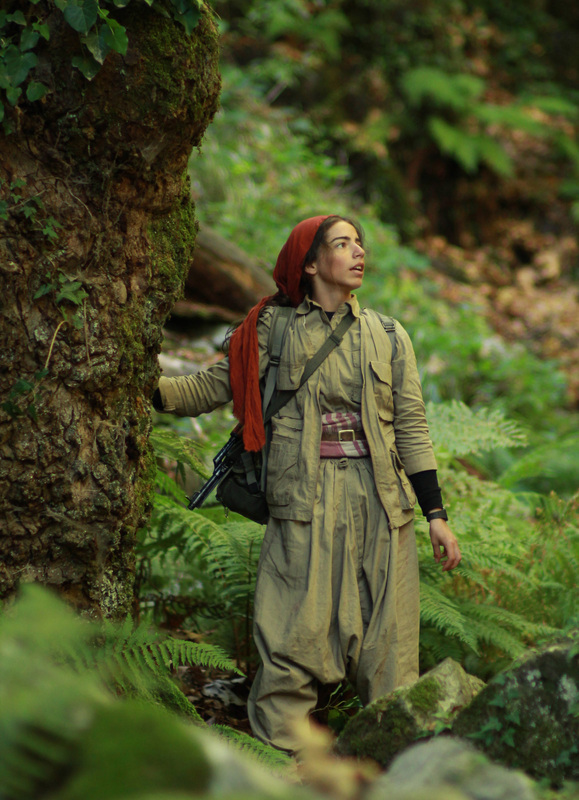 Writer-director Reha Erdem doesn’t make it easy for his audience, and why should he? His last to reach our shores, KOSMOS, was a metaphysical, almost super-hero, film about one stranger’s impact on a small border community. Now with JÎN, Erdem has created a masterful fairy tale that can be talked of in the same breath as THE COMPANY OF WOLVES. Imagine Little Red Riding Hood as a 17-year-old soldier, press ganged into service. Opening on a stunning vista of dawn on a mountain range, we get a montage of forests and animals, and then a young woman whose head is wrapped in a red shawl. Explosions and gunfire sunder the beatific scenery and silence. Jîn’s squad take shelter on a promontory, not out of place in THE LAST OF THE MOHICANS. A song about mothers appears to be the final straw, and she bolts for freedom. Now a deserter, both sides in the Turkey-Kurdish conflict are enemies. And so begins a gruelling and fraught journey. 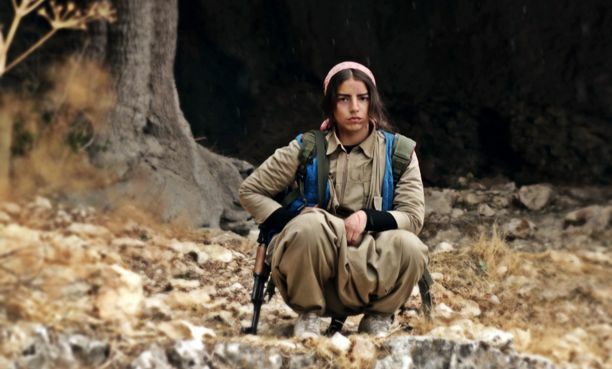 Jîn wants to get back to her mother, but is so far from home. Erdem and his team adroitly mix joie de vivre and tension, and humour, and beauty and fear. The overwhelming emotion is dread. Your stomach is in knots as the lead encounters various unsavoury ‘wolves’ – lustful and immoral men, who try to prey on this girl all alone in a conflict zone. A damning indictment on certain males, and war, though the film is celebration of courage, resourcefulness and determination. JÎN is in the same league as GRAVE OF THE FIREFLIES, LORE and EMPIRE OF THE SUN. While those mentioned are grounded in reality, this has the quality of a fable too – there is the constant threat of brutality, but something ethereal as well. Our heroine’s interactions with the animal kingdom (a bear, mountain lion, stag, etc.) are otherworldly. The war is destroying innocence and nature. The remarkable landscapes captured, elevate to an epic canvas. The jarring sound effects of detonations, planes and helicopters (without seeing any machinery) belie the likely budget constraints, but heighten the isolation. The audience gets sucked into a vision of a seductive hell. All AVATAR fans should see the wilderness depicted. However, the territory is dangerous; even truck drivers are wary of stopping for a young female hitchhiker for fear of traps and bandits. Elemental and haunting – a place where humanity has drained away for two hours. An enigmatic ending may suggest hope to some.